Nine new and free organic production guides are now available for farmers. The guides provide information on how to produce certified organic apples, blueberries, grapes, lettuce, potatoes, spinach, strawberries and cole crops, including cabbage, cauliflower, broccoli and Brussels sprouts. There is also a new guide on management of dairy cattle pests using organic integrated pest management (IPM) methods. This effort was coordinated by the New York State Integrated Pest Management Program at Cornell, funded by the New York State Department of Agriculture and Markets (NYSDAM). Download the guides at the NYS IPM Program website. 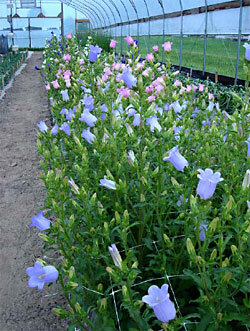 Chris Wien’s 2009 Cut Flower Trials summary is now available online. The summary includes trials in the field as well as in high tunnels — which extended the harvest season for local cut flower growers earlier in the spring and later in the fall. Monday, April 5, 12:15 p.m.
How do you build them? And how do you maintain these sky-high plants? Can you grow food on them? Is vertical greening the urban landscape of the future? In July 2009, Stephanie Gautama sets out on a journey to discover the answers of these questions. Sponsored by the Dreer Award, her 8-month’s research took her to meetings and internships in Zürich, Stockholm, Paris, Münich, Sydney, Melbourne and Singapore, with researchers, designers and entrepreneurs of the growing vertical greening industry. On this occasion, she returns to Cornell to share her findings. Horticulturists, landscape architects, planners and architects interested in incorporating vertical greenery into their projects should not miss this event! If you missed the N.Y. Small Farm Summit March 4, you can view videos of the morning’s progress reports online, as well as Dean Susan Henry’s noontime address. For more information about the Summit, visit the Cornell Small Farms Program website. N.Y. Small Farm Summit: Welcome, Anu Rangarajan from Cornell Horticulture on Vimeo. N.Y. Small Farm Summit: Dean Susan Henry from Cornell Horticulture on Vimeo. The Department of Horticulture’s Flower Bulb Research Program website has a new look and updated information following its relaunch today. 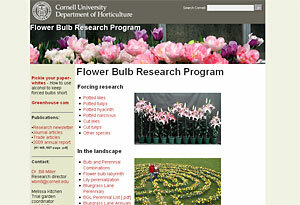 The site features research summaries of the Program’s work on forced tulips and lilies, a research newsletter archive, the program’s latest annual report, and links to other Program efforts, including Bulb and Perennial Combinations, Flower bulb labyrinth and more. According to a Cornell Chronicle article, Cornell researchers — with funding from the Cornell Center for a Sustainable Future (CCSF) and Cornell Civic Ecology Lab (CEL) — are playing a major role in Mayor Michael Bloomberg’s citywide, public-private MillionTreesNYC initiative to plant one million trees in the city by 2017. Get experience growing, maintaining and evaluating plants. 35 hour/week paid internship, June 1 to Aug 20. Application deadline extended to April 15. For more information, see poster or contact Melissa Kitchen at 607-280-4898 or mjb239@cornell.edu. Lloyd Traven (M. S. ’81 – Floriculture and Ornamental Horticulture), owner/partner of Peace Tree Farm Kintnersville, Pa., shared his propagation expertise and showcased some stunning begonias on the Martha Stewart Show March 2. View video of the segment here. 8-week online course starts April 5 and is designed to help experienced gardeners broaden their understanding of organic techniques for all kinds of gardens. With a strong foundation in soil health and its impact on plant health, we then explore tried-and-true and cutting-edge techniques for all different kinds of garden plants – annuals and perennials, food plants and ornamentals. Introduction: What is Organic Gardening? Cost: $300. More information, registration.